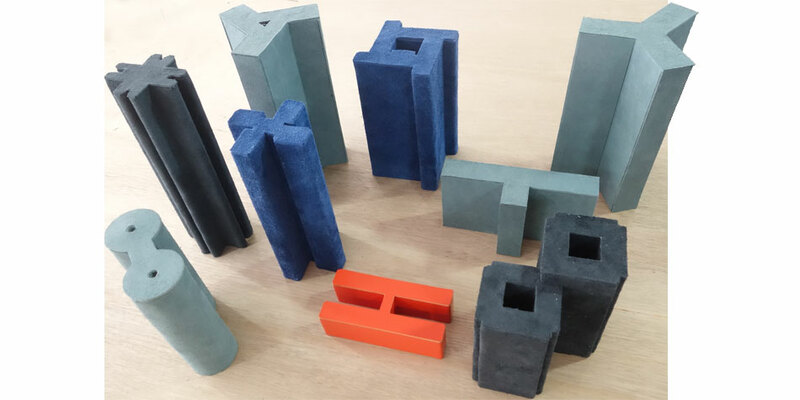 Our project is entitled “Leather as Architecture: The Utility of Luxury” and is composed of an organic clustering of handcrafted leather models of prototypical Hong Kong public housing projects from the 1950s to today. 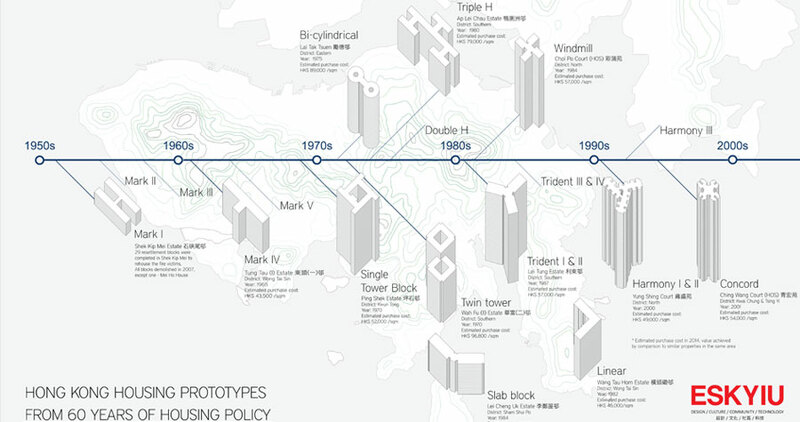 These include: Mark I, Mark IV, Bi-Cylindrical, Single Tower Block, Twin Tower, Windmill, Trident, Concord and Harmony. Taking on the MPW curatorial brief (*) of utilizing “1 square meter of leather,” our model community is composed exactly out of 1 square meter of scrap leather we collected from a factory in Fo Shan, China. The factory currently manufactures luxury bags out of leather and we sought to produce a project out of the waste from the production process. In order to create the perfect leather bag, the process of perfection requires a vast amount of waste and leftover pieces, mostly due to blemishes found within natural leather. For this project we question how “value” is perceived and obtained. 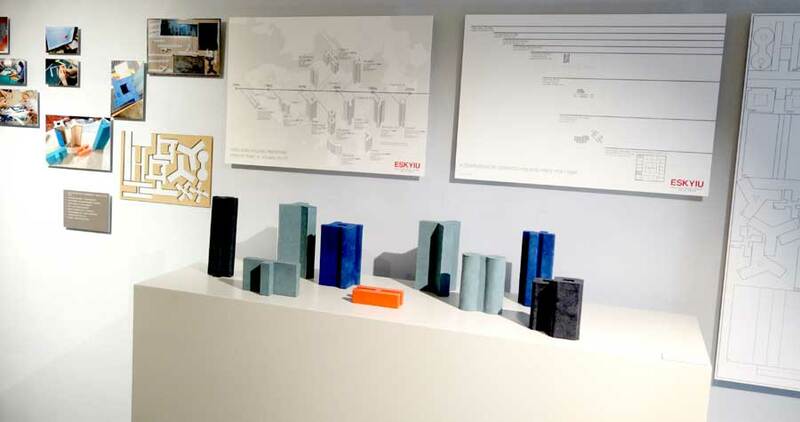 One of our architectural models depicts the first public housing building in Hong Kong, the Mark 1, created as a response to the emergency need for housing in Shek Kip Mei after a fire on Christmas day in 1953. Here we used a vivid red-orange leather to denote the colour of immediate need, while for the other models we utilized a cheaper leather, instead of a more refined process used for expensive leather. 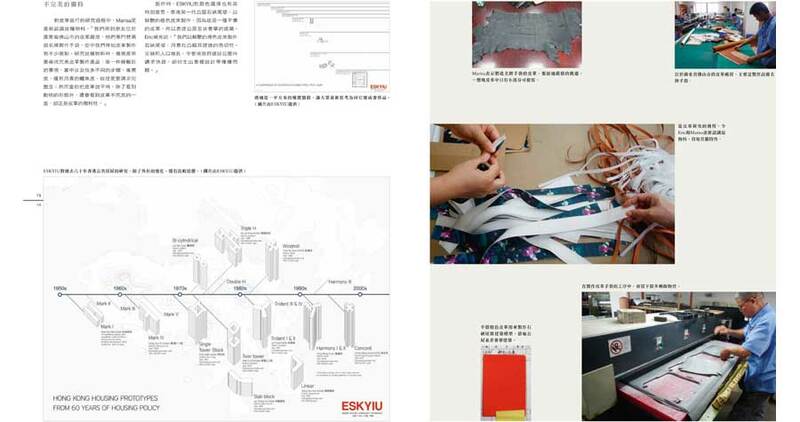 Our studio practice ESKYIU is fascinated by the culture of consumption and production in Hong Kong and the Pearl River Delta and in particular how the process of making informs our understanding of the built environment. In the mapping drawings we question the value of property in Hong Kong by revealing how wealth and values have changed in the last few decades. We continue to raise questions about the function of utility and where the utilitarian becomes a luxury; for today most of the buildings in Hong Kong are generic towers duplicated and multiplied to fulfill the needs of living, yet the property prices per square meter are at a constant extreme. This presents a wide range of values for our society. However, as designers and architects we are challenged to seek better ways to make architecture more natural, more unique, less generic and with better quality. Perhaps architecture can become softer, freer, more sensual, more humanistic, well-crafted and with an approach that makes better use of the waste. Venue: H506- H607, Hollywood, PMQ, 35 Aberdeen Street, Central, HK. 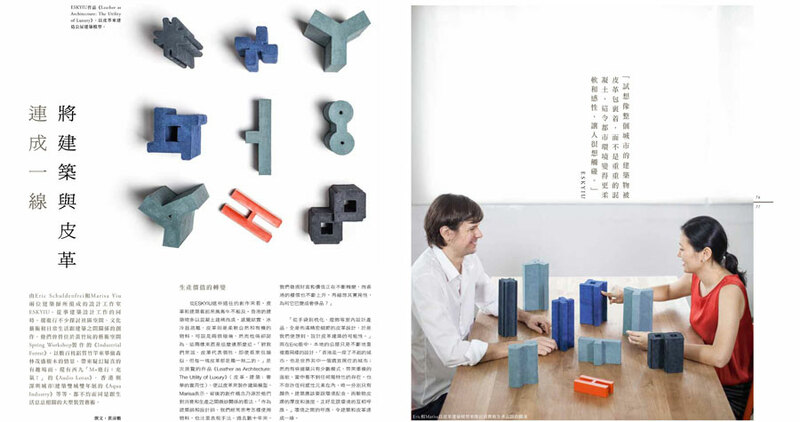 (*) A Square Meter of Sensation, Curatorial Brief by Mingpao Weekly. Living in a world dominated by social media and virtual reality, we are now losing our sense and sensibility in connecting to people and the world around. Tangibility has become an “old value” and seems forgotten. How can we recover and gaining back our sense and sensibility? Leather is the skin protecting the bodies but also the very first medium for us to feel the surrounding world. It has a subtle and soft touch, as well as a specific warmness and reason why leather is always one of the most beloved raw materials. 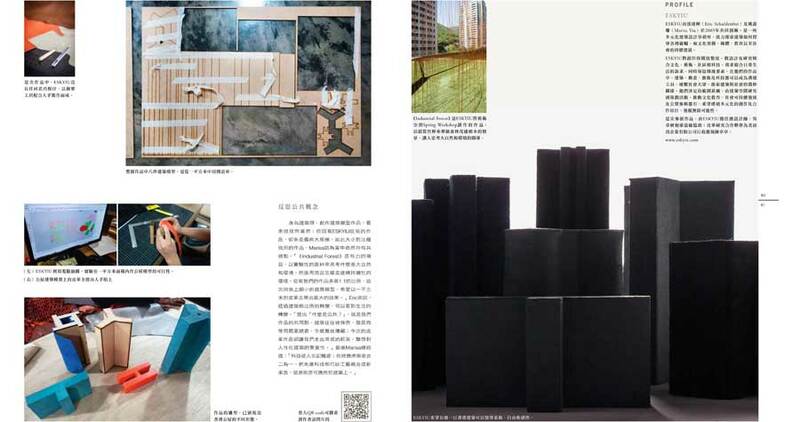 We have invited Hong Kong local artist, designer, architects and photographers to join this project of exploring the potentials and possibilities of leather. The creativity could be a daily life object or an artwork, experimental, conceptual or practical and useful. The only “rule” will be the material use of 1 Sq. metre use of leather. 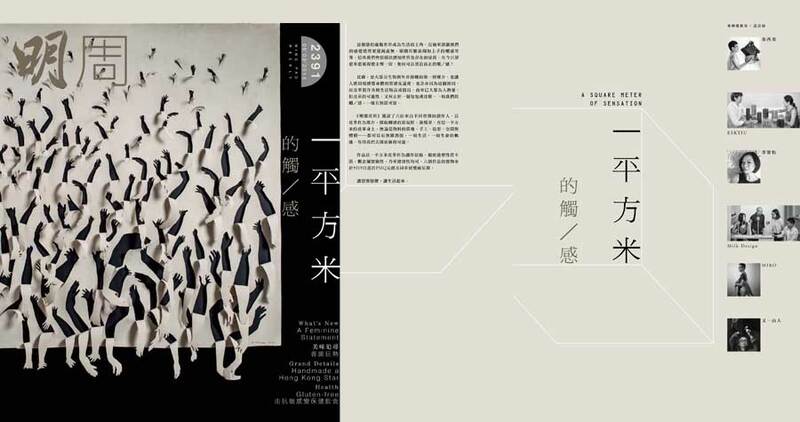 Invited artist/ designers include: Edith Cheung, ESKYIU, Bovey Lee, Milk Design, Miro, and Stanley Wong (Anothermountainman). Images above include print publication from MPW’s Book B, Sept 6th 2014 (print edition 2391), P. 76-81. Video interview by MPW: See here at this link.